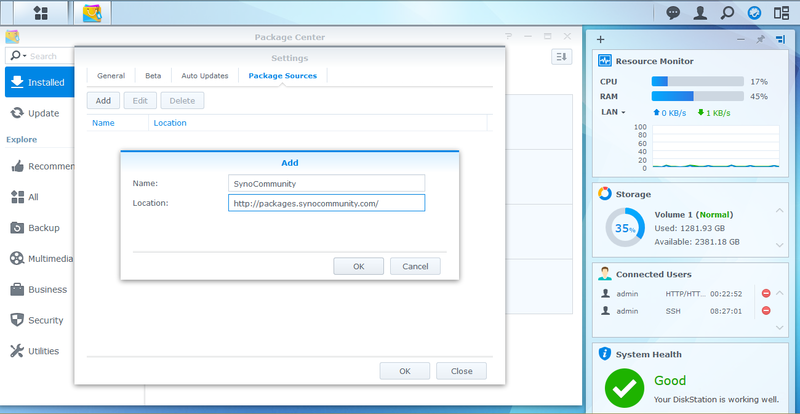 You can add a new package source to add more programs to your Synology NAS. We will be adding the SynoCommunity software repository. BitlBee – BitlBee brings IM (instant messaging) to IRC clients. It’s a great solution for people who have an IRC client running all the time and don’t want to run an additional MSN/AIM/whatever client. BitTorrent Sync – Automatically sync files via secure, distributed technology. 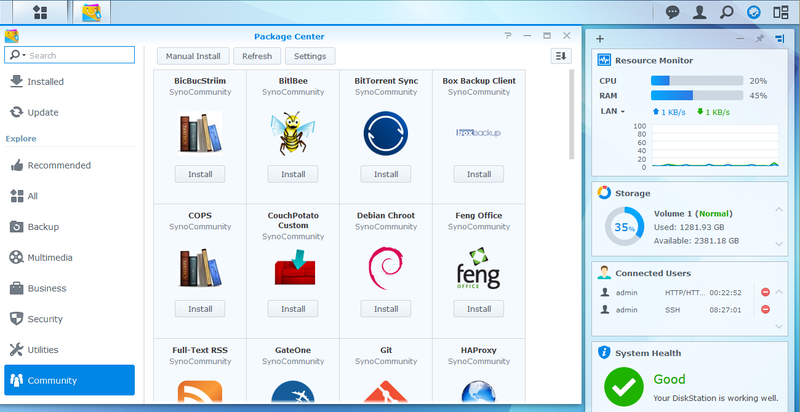 Box Backup Client – Box Backup is an open source, completely automatic, on-line backup system. This is the client part of Box Backup. COPS – Calibre OPDS and HTML PHP Server : light alternative to Calibre content server / Calibre2OPDS. CouchPotato Custom – CouchPotato Custom allows you to run the fork of your choice of CouchPotato. You will be asked for the fork’s git URL during install. Feng Office – Feng Office is a Collaboration Platform and Project Management System. Full-Text RSS – Create full-text feed from feed or webpage URL. Git – Git is a free and open source distributed version control system designed to handle everything from small to very large projects with speed and efficiency. HAProxy – HAProxy is a free, very fast and reliable solution offering high availability, load balancing, and proxying for TCP and HTTP-based applications. HTPC-Manager – Contol your Htpc with ease. Using multiple applications to control you htpc? No More! Htpc Manager combines all your software and provides an easy way to controll them all! MantisBT – Mantis is an easily deployable, web based bugtracker to aid product bug tracking. It requires PHP, MySQL and a web server. It is simpler than Bugzilla and easily editable. Midnight Commander – Midnight Commander is a console application with a text user interface. The main interface consists of two panels which display the file system. ownCloud – ownCloud is a personal cloud which runs on your own server and gives you freedom and control over your own data. Python – Python Programming Language. Python3 – Python Programming Language. Redis – Redis is an open source, advanced key-value store. It is often referred to as a data structure server since keys can contain strings, hashes, lists, sets and sorted sets. Selfoss – The new multipurpose rss reader, live stream, mashup, aggregation web application. SickBeard Custom – SickBeard Custom allows you to run the fork of your choice of SickBeard. You will be asked for the fork’s git URL during install. Transmission – Transmission is an easy and fast BitTorrent client. You can control it remotely with its web interface or dedicated applications.